Join us today and learn how simple and convenient sunless tanning is. You can choose from spray tans or UV tanning beds and booths, allowing you a last, sun-kissed look, or a temporary look for a special event. Stop in today and enjoy the cleaning, friendliest, and longest-standing salon in the area for skilled, knowledgeable tanning services and advice to maintain your look. Live like summer never ends and keep your glow year-round at Guilty Tans in Cathedral City, California. 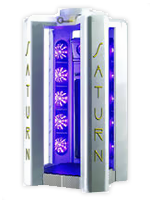 Our tanning salon features the latest tanning beds and spray tan options for people who enjoy the beauty of a flawless, natural tan. Since 2000, summer lovers have counted on us to help them maintain their glow no matter how cold or cloudy it gets. Choose from UV and UV-free options, and enjoy our high-end services at affordable rates, and know that you can trust our skilled team. We have more than 20 years of experience and are the longest continually-running, same-owner salon in the area.